The exhibition Album: Cinematheque Tangier, a project by Yto Barrada includes films, artworks, and artifacts that speak to artist Yto Barrada’s connection with the social and political realities that shape her hometown of Tangier—its rich and fractured history of migration, indigenous communities, and colonization. In 2006, Barrada founded the independent cinema Cinémathèque de Tanger in a languishing structure in the city’s famed Casbah district as a way to engage with the collective memory and material history of Tangier. Cinema Rif, as the theater is named, was brought to life as both a thriving cultural center and a place to discover the films and remarkable history of filmmaking in the region. 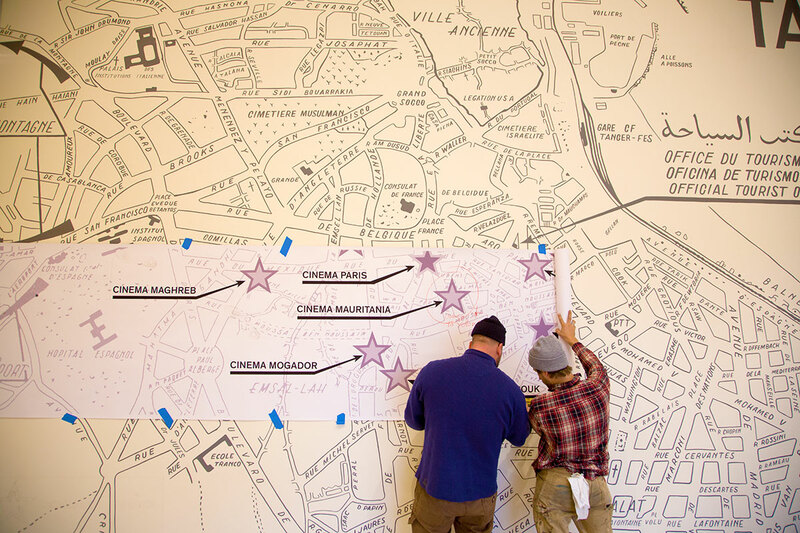 Curators Sheryl Mousley and Clara Kim commissioned local sign painter Dan Madsen (Dusty Signs) to recreate a map of Tangier on the gallery wall, which identifies the location of theaters past and present in this coastal Moroccan city. 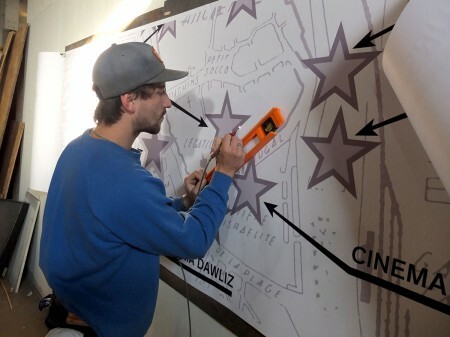 Over the course of 193 hours, Dan and fellow sign painter Forrest Wozniak tirelessly brought the 16-by-25-foot map to life, in what Dan referred to as “sign painter’s boot camp.” It was nice having sign painters in house for a couple weeks, showing us how they do what they do. Below is an interview with Dan about his history of sign painting, the techniques he uses, and the resurgence of interest in hand-lettering. How did you originally get in to sign painting? 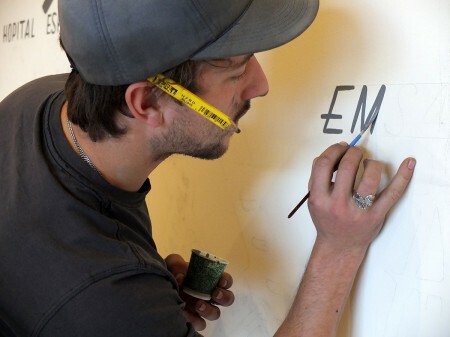 Did you always want to be a sign painter? I came into the sign business in 2007 working for a large sign shop. 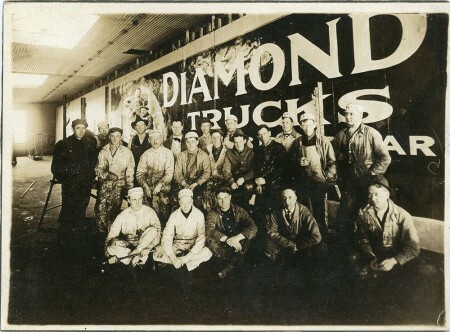 That same year my grandfather passed away and I discovered that his father (my great grandfather) was a sign painter here in Minneapolis. He worked for the largest outdoor advertising company in America called General Outdoor Advertising. 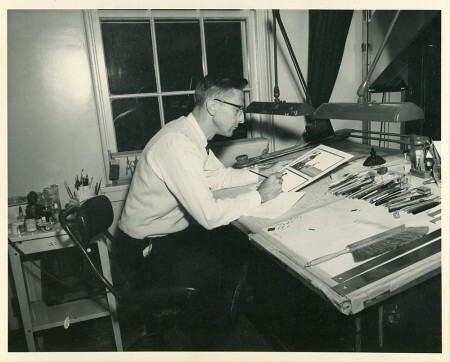 I inherited old brushes, books, drawings, and photographs from him. Lettering was always something I enjoyed because of my grandfather. He was a medical illustrator and calligrapher for the local VA hospital. I remember as a young kid playing in my grandpa’s studio, writing my name with his calligraphy pens. So when I discovered that great grandfather was a sign painter, I decided to practice traditional sign painting. Now its six years later and I work for myself under the name of Dusty Signs. 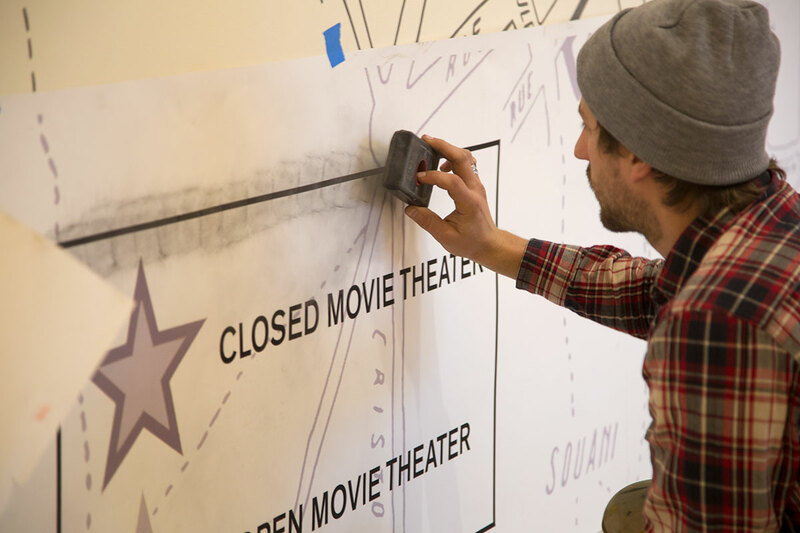 A lot of sign painters seem to be inherently suspicious of modern signage techniques, such as vinyl lettering. Do you look around and feel overwhelmed with the amount of terrible signs there are? How do you understand our contemporary visual environment in America? Yeah, there are a lot of bad signs out there, but there are also a lot of good ones. Being a sign painter, I don’t think everything needs to be hand painted. I think there is a time and place for everything. I still get a kick out of seeing nicely made neon signs or metal fabricated signs. It is unfortunate though when you look at a sign and you can tell the designer just pressed a few buttons using bad pre-existing fonts and then had a sign shop just pop that out as fast as possible. Nowadays people rely on the computer too much. A computer is a tool and it can do great things, but sometimes you have to put the computer down, pick up a pencil and hand draft. I’ve been noticing more people want signage hand painted lately, so I’m hoping things might get better here in America, at least visually. Can you describe the process of creating this wall mural? Step 1: First I print out the design scaled to actual size on paper in my studio. Step 2: Next I use a machine called an Electro Pounce to perforate the paper where the lines will be. 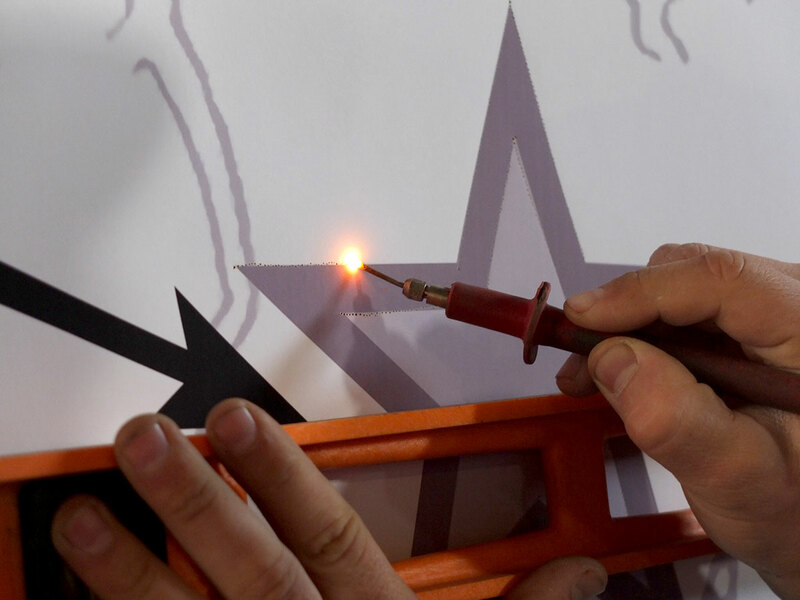 It is basically an electrified stylus that burns a series of holes into the paper. Step 3: Then I tape the paper patterns onto the wall and apply charcoal to pounce through the little perforated holes, and take the paper down again. This leaves a faint outline of the design on the wall for me to work from. Step 4: Finally I paint over the charcoal outlines with a brush. It’s up to me how true to the charcoal outlines I need to stay, and when I can deviate based on experience. Michelangelo used the same technique. 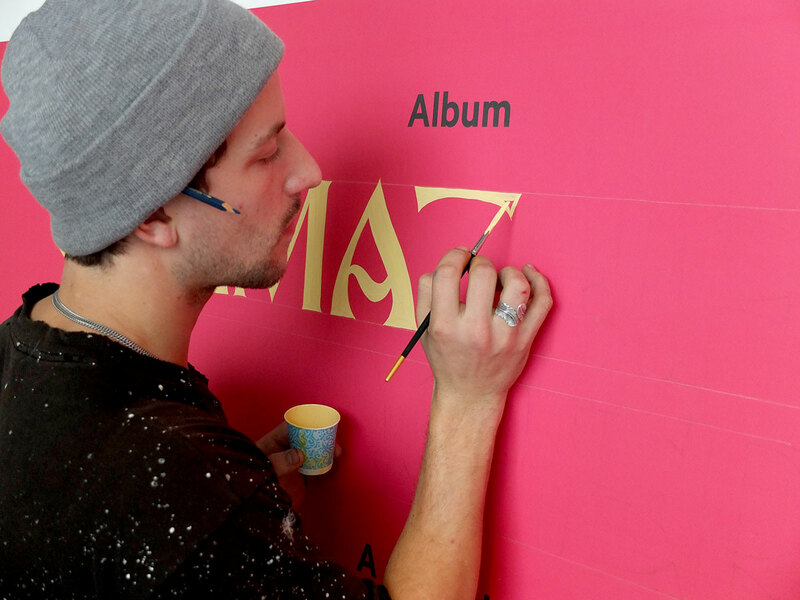 Were you inspired by any of the Moroccan hand-painted lettering in the exhibition? Definitely inspired. I love seeing hand-painted signs from all around the world. In some countries sign painting is popular not by choice but because it is the only option people can afford. The signs aren’t always the most refined, but I still love seeing them — they aren’t overly romanticized, in search of some kind of “Instagram fame.” Some of the movie posters in this exhibition reminded me of that. We didn’t actually emulate any particular kind of sign painting for the map, but instead used a simple blueprint lettering. 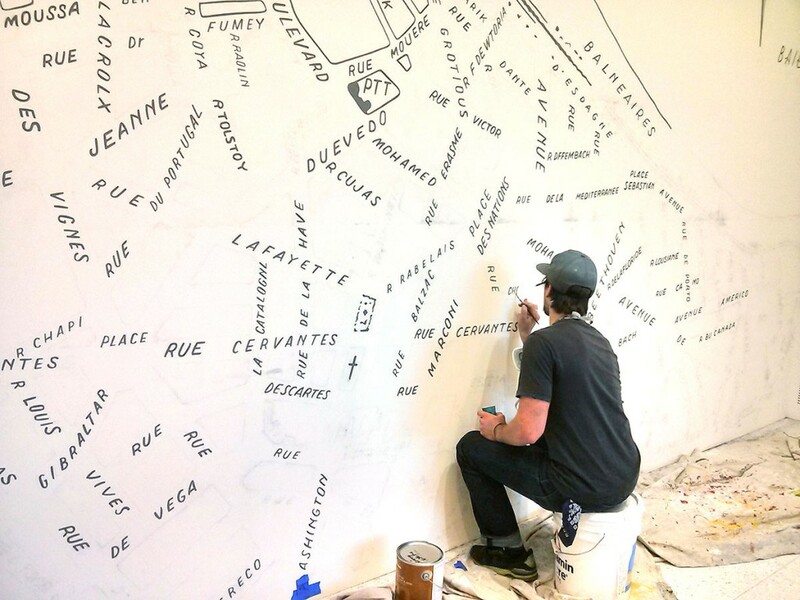 The original image of the map was not very hi-res, so we were free to extrapolate a typographic style that made sense, and translate the original into something new on the wall. 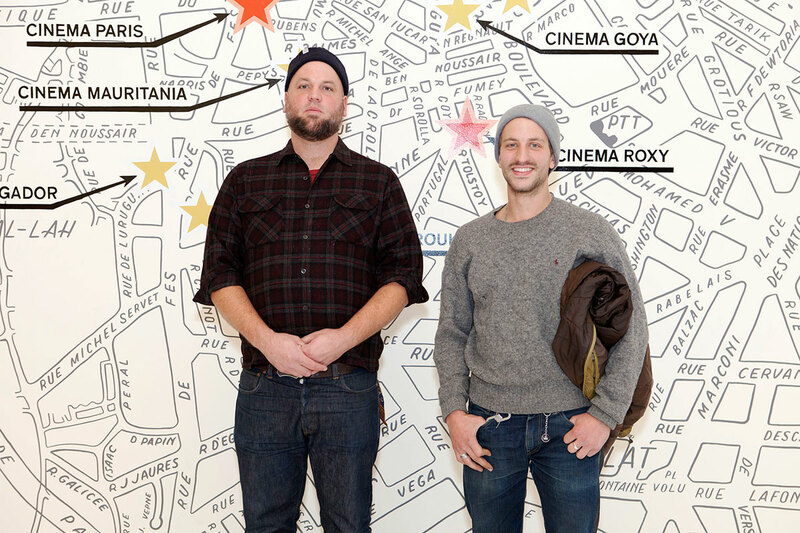 What did you think of the Sign Painters movie (and the book it was based on) that came out recently? I thought it was really great, although I wish they would’ve acknowledged the type of sign painters you see working on East Lake Street, painting all the windows in Latino shops. Those guys are the real deal. I’ve got a lot of respect for how fast and consistent they can paint. Working at the Walker was cool and we got a lot of positive feedback from folks while working. It was nice to work in the context of an art museum, because sometimes when working out on the street we’re looked at as more industrial house painters. That all depends on the viewer, I guess.